Quick review of Dice Wars. 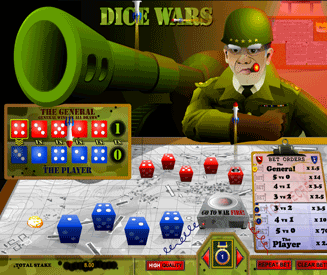 Dice Wars at its core is a simple dice-based fixed-odds game. However, although the game format and betting structure is fairly basic, the imaginative gameplay and graphics help to propel an otherwise simple idea in to an absolute gem of a dice game. The object of Dice Wars is deceptively simple. It’s you (referred to as "The Player") vs. "The General", and all you have to do is wager on who will roll the highest number on each of your five dice. The player who rolls the biggest numbers on the corresponding dice will win the game. Whilst this hardly sounds like a recipe for no-holds barred fun, the rocket-firing battle interlude is surprisingly captivating. Maybe I didn’t play "army" quite enough as a child, but either way Dice Wars is a game that I’m not ashamed to say I love to play. Dice Wars rating - 75%. The rules are straightforward and the betting options are simple, so what is it exactly that makes Dice Wars a fun game? 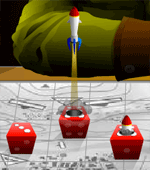 The person that invented Dice Wars was clever, but the person that suggested adding rockets and a battlefield was a genius. It’s amazing how far a little war-based ingenuity will take you. 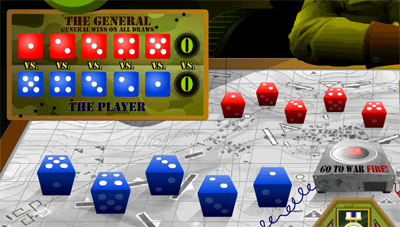 The short battle sequence at the end of a Dice Wars game adds that all important entertainment factor and tension. Placing your bets is alright, but watching the results roll in is by far the best part about the whole Dice Wars experience. Fact: Pushing a big red flashing "Go To War" button is also as scarily satisfying as you hoped it would be. In fairness, Dice Wars isn’t a high paying game, nor are the betting options all that adventurous. Nonetheless I can assure you that you will have a great time playing this game. Give it a try. Wager as much as you like on as many of the outcomes as you want. Roll the dice, watch the rockets fly around and hope that the team you bet on wins. Betting is simple, watching the results is a riot. In each game, the five dice that belong to both "The General" and "The Player" will be rolled. Each player has corresponding dice, so the first dice of the "The Player" corresponds to the first dice of "The General" and so on. The player that rolls the highest number on each corresponding dice will win for that particular dice battle. So, if The General rolls a 2 and The Player rolls a 5, The Player wins. The winning dice will then fire a rocket to destroy the opposing dice. Awesome. The player that has the most winning dice (the one with the higher corresponding dice rolls) left at the end of the game will win the war. Note: If the numbers on the corresponding dice roll is the same (e.g. The General and The Player both roll a 3), The General wins. This gives The General a slight advantage in the game. There are two main wagering options in Dice Wars. The exact result of the war. 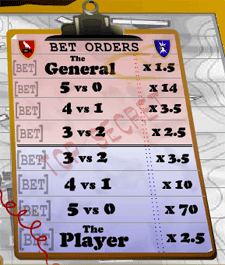 Wagering on the overall winner is straightforward, as the player with the most dice left at the end of the battle wins. If you wager on the exact result, you have to try and guess the exact number of dice that each of the players will be left with at the end of the war. As you can imagine, this generally provides a bigger payout if you guess correctly. The General has slightly favourable odds due to the fact that he will win on all draws. You can bet on as many outcomes as you like. You are not restricted to betting on just one outcome. So for example, you could bet on The General being the overall winner, and also bet that he will win the war with 4 dice against 1 at the end. Additional feature: high and low quality option. You can choose to set the game animation in Dice Wars to either low or high quality. Honestly though, I can hardly tell the difference between the two. I guess the low animation quality might help if you’re running a computer from the 1990s, but for the rest of us there’s no reason why we can’t ramp up the quality and bask in the glory of 10 or so extra pixels.